Does Your Future Lie in Architecture? Advantage of architecture as a profession is primarily that it is creative work and permits exercise of imagination and requires a broad and accurate knowledge of many things in designing buildings to meet requirements. Professor of Architecture, University of Minnesota Fifth of a series to help you in choosing a vocation. AN ARCHITECT is a person who designs buildings to meet special requirements. He strives to meet the needs so perfectly that his buildings may become beautiful. His designs are not merely picture on paper, but an image in his mind of the building actually translated into material form. To build this image in his mind he must think through every part of it and ultimately show his conception by drawings in order that his client and the builder may see and understand it. Design therefore, involves many things including planning and construction, selection of materials, equipment and the working out of every part in detail. The architect’s work also includes the supervision and much of the business and organization of the process of producing the actual building from his design. 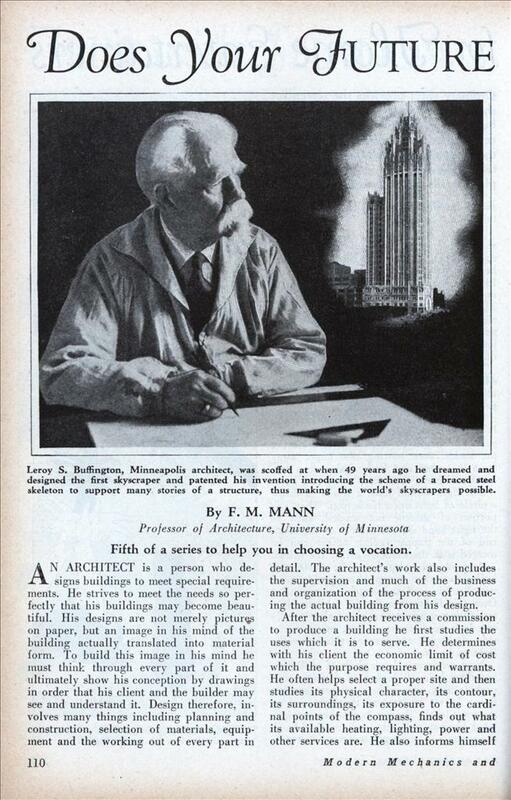 After the architect receives a commission to produce a building he first studies the uses which it is to serve. He determines with his client the economic limit of cost which the purpose requires and warrants. He often helps select a proper site and then studies its physical character, its contour, its surroundings, its exposure to the cardinal points of the compass, finds out what its available heating, lighting, power and other services are. He also informs himself fully as to the requirements of the proposed uses of the building and to the means by which all such requirements may be met. He then proceeds to work out various possible plans and in conference with his client finally develops a plan that seems to his client and to himself to meet all requirements in the most perfect way possible. After the plan is developed he selects the materials to be used and works out the general exterior appearance best suited to the purpose of the building. From the beginning he must consider how the various parts can be constructed most simply, and economically. Thus far the work is in what can be called the preliminary stage. When the form of the building and its parts becomes definite he must begin to calculate each part for strength and economy and, in order to make the building fit its requirements practically, he must perfect all forms and proportions. If it perfectly fits its purpose his design begins to give a degree of satisfaction beyond the utilitarian and takes on elements of beauty. Thus far the architect has perfected his conception or “design” and perhaps determined the exact size and strength of all structural members. In order to translate this design into material form many drawings are required and the office draftsmen are called upon to lay out the various parts to exact scale. Even on relatively simple buildings many sheets of drawings are necessary and on large buildings the number of drawings often runs into hundreds. 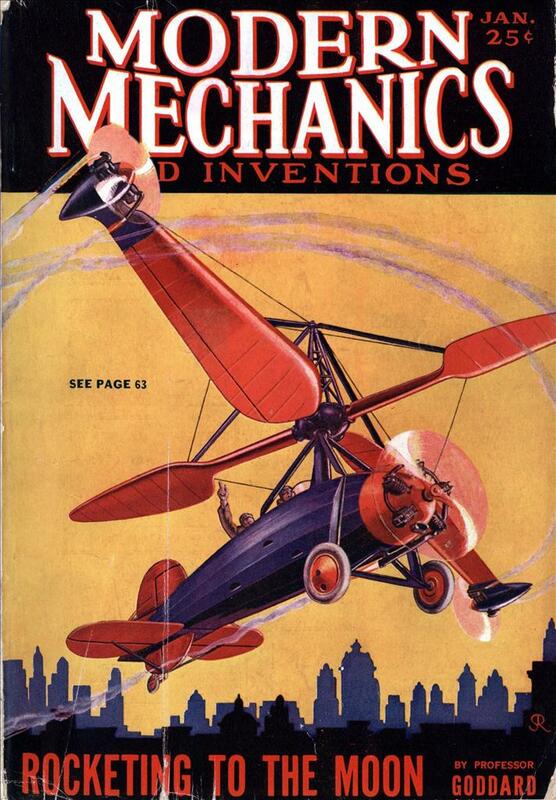 Meanwhile the mechanical requirements are studied and developed. These include heating, ventilation, plumbing and electrical equipment, all of which must not only be calculated, but must be completely shown on drawings. When the drawings reach a stage of substantial completion the specifications are begun. The specifications exactly describe the materials and methods that are to be used and followed in the construction of the building. When drawings and specifications have been completed and approved by the owner, bids are invited from building contractors and are received usually at the architect’s office. These bids are then studied and analyzed and a report prepared for the owner, who, in consultation with the architect, determines which bid is most advantageous. The architect then prepares agreement documents, and the contractor selected and the owner sign these and the actual building operation is ready to begin. During the construction work the architect supervises the work at the building both to see that the plans and specifications are being followed in detail and to explain and interpret their intention to the builder. I have stated the above to indicate the complexity and responsibility involved in the architect’s work. The advantage of architecture as a profession is primarily that it is creative work and permits the exercise of imagination, acknowledged to be one of the finest of human faculties, and requires a broad and accurate knowledge of many things. The architect’s work also includes the business of organizing and directing the complicated operations of building. If the young man entering the profession of architecture has the aim to arrive at a high place in the profession where he will win fame, the responsibilities and the corresponding emoluments of a large practice, he must expect advancement toward his goal to be slow. The same may be said of high places in any other profession or business. As to earnings, a man is paid in proportion to the service he renders. The importance of architecture in human activities is obviously great. Shelter is a primary necessity and beyond common necessity happiness and efficiency are dependent upon pleasant environment and are increased by the element of beauty. The architect has to do with all of these. His ideal is to create beauty as well as to satisfy the requirements of utility.